Located close to La Barceloneta Beach, Can Paixano is an authentic Spanish bar famous for its 1-euro Cava (Catalan sparkling wine) and 3-euro gourmet tapas (assortments of meats, cheeses, and sandwiches.) This establishment has been around for 50 years and is a local favorite so it gets busy (and loud.) The atmosphere is distinctly Spanish and is a great place to spend an evening with friends. This is one of the best places to get paella in Barcelona, hands down! 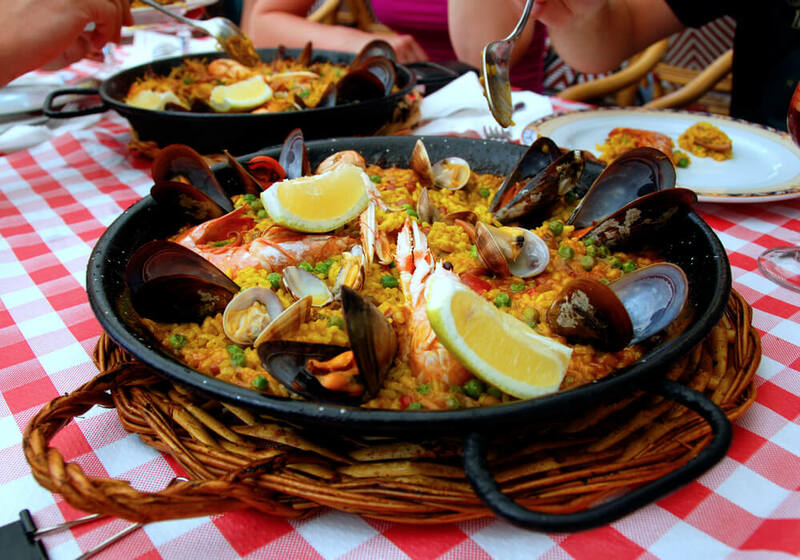 You can choose from a variety of flavors and have your paella delivered piping hot and fast. Be sure to try the squid ink paella! This is a cozy and casual bar and restaurant just around the corner from La Sagrada Familia. Here, you’ll find lots of yummy, fresh tapas at an affordable price. The patatas bravas are especially great! Although it’s located in a touristy plaza, this restaurant serves up some authentic Spanish dishes. You’ll find everything from tapas to rabbit paella at a reasonable price. The meat dishes come in large portions. Pretentious, tourist-bait name aside, this restaurant is surprisingly really good. It serves Italian-Spanish fusion food for groups. I’m not even a fan of fusion food, but somehow it worked for me. You’ll find tons of meats as well as seafood and vegetarian dishes. The oysters and ice cream were the highlights! Located in the busy Las Ramblas street, La Boqueria is the most popular market in Barcelona, Here, you’ll find every type of seafood imaginable. Prices are higher than average so one visit here will suffice. I’d recommend the sepia, cuttlefish. This little restaurant is located in an obscure street in the Gothic Quarter so it maybe be difficult to find. But the search is so worth it. There’s only enough room for about 20 people, but the staff is super friendly and the food will leave you wanting more. The mango-chutney salad and Posticino Strepitoso are some favorites. This is a truly amazing seafood spot in the Gothic Quarter. You’ll find my absolute faves – Galician razor clams – as well as all the other typical seafood dishes. The paellas are great too and so are the octopus. Cochinillo Asado (suckling pig) is a must-try dish for meat lovers. Originally from Segovia, it’s slowly-roasted and lightly seasoned, in keeping with Spanish cooking. Restaurante Rokelin is the place to try Cochinillo Asado in Barcelona. Just go. This restaurant, whose name little means ‘food of the pot,’ is down the street from Park Guell. Here, you’ll find a variety of dishes from all over Spain, from Gazpacho and Salmorejo to Paella and roasted meat. The menu del dia (menu of the day) comes with 3 courses and costs less than 20 euros. At Chen Ji, you’ll get generous portions of delicious Chinese food at rock bottom prices. Indecisive people beware. The menu has more than 100 dishes to choose from! It’s like the Chinese Cheesecake Factory. You’ll find staple dishes like fried rice and noodles as well as Chinese delicacies. The best thing about this place is that it’s dirt cheap – most items are in the 5 euro range! This is an Argentinian-Uruguayan restaurant known for its quality meats and steaks. For less than 10€, you can get a good-sized skirt steak along with a salad, rice, or potatoes, and homemade dressing. Some of their meats are on the expensive side, but you can still enjoy a full meal here for less than 40 euros. Santa Ceviche is a small, family-run Peruvian restaurant with friendly service and a cozy atmosphere. If you’re a ceviche lover like me, then you have to give this place a try. The fish and seafood are super fresh and delicious! This is a busy burger joint where locals often go during football games. The food and drinks are a good value. The downside is that the location is normally packed with rowdy teenagers who just discovered drinking. This is a low-key Lebanese restaurant that serves some really tasty food. Located in the heart of the Gracia neighborhood, it’s owned by a friendly Lebanese couple. From hummus to tabouleh to toum, you’ll have a bunch of great salads and appetizers to choose from. The main courses come in huge portions so make sure to leave room. Ziryab is another Middle Eastern hotspot in Barcelona, although it’s actually a Spanish-Middle Eastern fusion joint. This restaurant is known for its wines, shisha, and super chill atmosphere. The super friendly staff are the icing on the cake. This is a Mexican restaurant specializing in Sinaloa cuisine. The quesadillas and nachos are a must! Their micheladas are also really popular. Note that this place is a cash-only establishment. La Taberna Griega (The Greek Tavern) is a great spot for Greek favorites like souvlaki and feta cheese fries. It’s also dirt cheap. What more could you ask for? If you’re in the mood for Ethiopian, head over to Addis Abeba for a feast. The portions are generous and the prices are great. As with Ethiopian food in general, this joint is vegetarian-friendly. This bicycle-themed, quirky cafe is a nice spot to relax and have a nice chat with friends. Their carrot cake and freshly-squeezed orange juice are a great combo. Mama’s Cafe is a cozy little coffee shop with vegetarian-friendly and gluten-free options. The pancakes and pizzas are delicious! Carrer de Petrixol is a street that’s famous for its churros, and one of the top churros spots there is Granja Dulcinea. 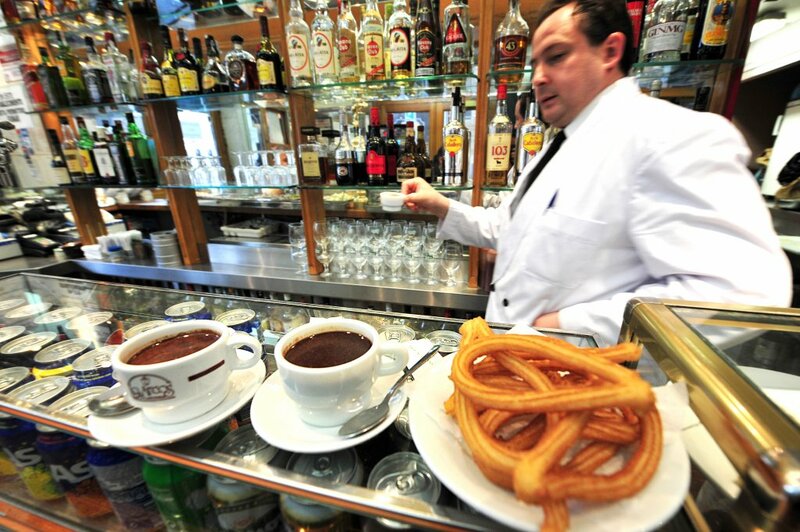 Churros con chocolate, churros with hot chocolate, are a staple Spanish breakfast you need to try at least once. Also on Carrer de Petrixol is Petrixol Xocoa, where you can also grab some delicious churros at rock bottom prices. Also try porras, which are bigger and fluffier than churros. I personally think they’re better than churros. This is a hipster coffee spot that is both dirt cheap and healthy. Most items on the menu are between 2-8 euros! You have to try the smoked salmon and avocado tostada. This cafe is located behind the Illia Diagonal Shopping Center. This company offers specialized food tours in Spain and Portugal with guides that really know the food scene. Their Barcelona tours will take you to top tapas bars to wine tasting day trips. You can choose from nine different food tours on their website. 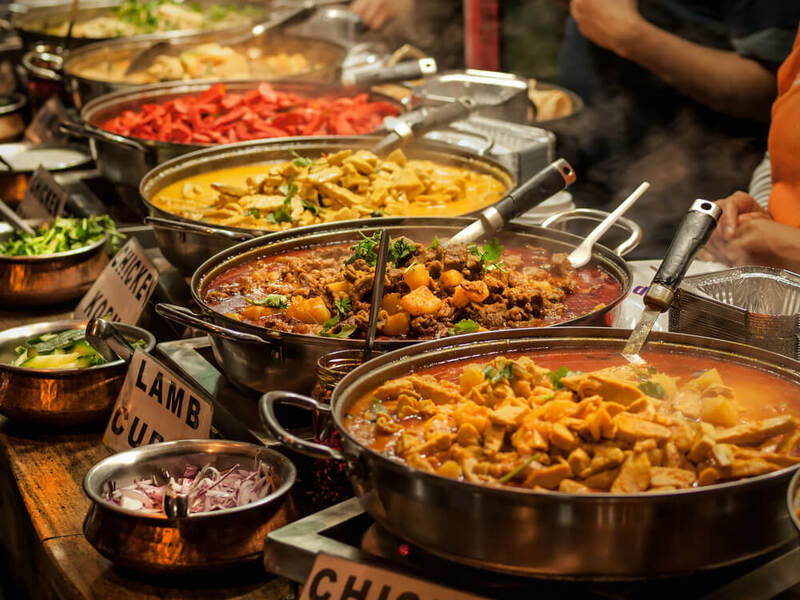 Devour Food Tours, which operate in a few cities across Spain, give you a taste of Spanish cuisine with tours of the finest establishments at an affordable price. It was founded by a travel blogger who’s been living in Spain for years. 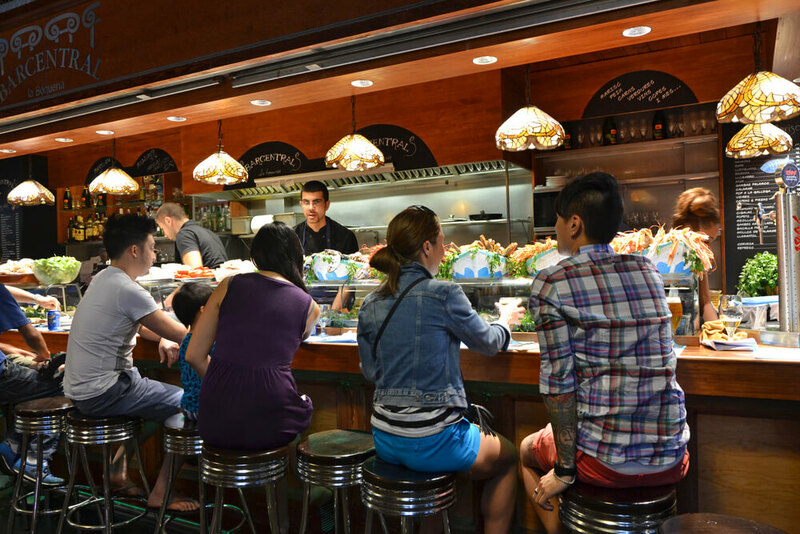 The Barcelona Tapas and Winery Tours are the most popular and highest-rated tours. Take a look at the Devour Food Tours calendar to book the perfect tour for you. Barcelona Food Tour wants to allow you to experience the best of the city’s food scene like a local. The company caters to travelers looking for a culinary experience you won’t find in mainstream guides like Lonely Planet. From off-the-beaten-path tapas bars to traditional Catalan brunch spots, you’ll find a mix of food offerings on their tours. Learn more about Barcelona Food Tour. The Barcelona Taste is best known for its all-inclusive tapas tours. For one flat fee, they take you to 3-4 tapas bars where you can eat as much as your heart desires. Drinks like vermut and beer are included. 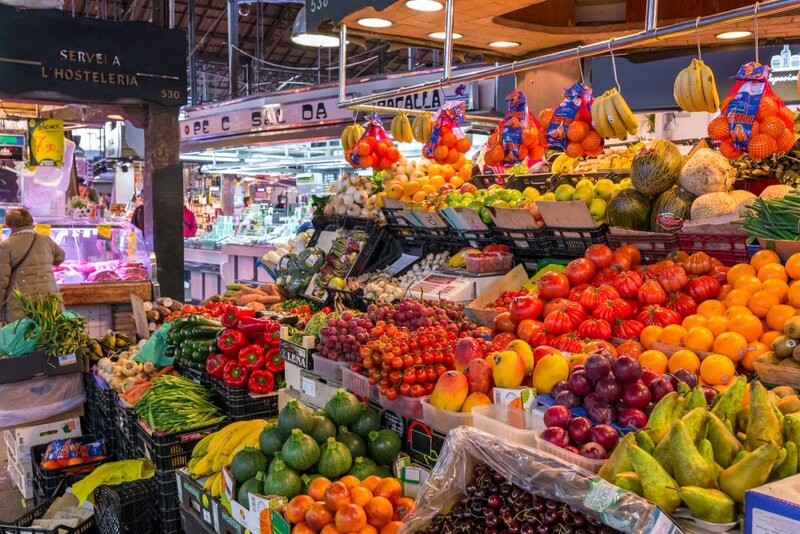 Barcelona Eat Local offers four top-rated food tours that’ll introduce you to Catalan cuisine. They all last 3-4 hours. One unique offering is a multi-course dinner gathering, which is perfect for couples. Check out their complete list of food tours. Wanderbreak’s walking food tours combine history, culture, and cuisine to paint a complete picture of Barcelona. The company offers a unique Gourmet Gaudi experience, which combines tours of famous modernist architecture around the city with fine dining experiences. Secret Food Tours takes you to experience the most authentic establishments in the Born and Barceloneta areas of the city. It’s run by locals who want to show you the best of Catalan cuisine. Find out about Secret Food Tours. VinBcn provides a guided experience of Barcelona’s nightlife – pubs, bars, and nightclubs. Complete with free shots, a private photographer, and skip-the-line access into the top clubs, this is a great way to spend a night with friends or meet new people. Learn more about VinBcn’s nightlife experiences. Centrally located on Las Ramblas, La Isabela is one of the best places to get a 360 view of the city. It also has a pool, lounges, and an extensive menu of tapas and drinks. I’d recommend you make a reservation as this place is in high demand. La Dolce Vitae is a gorgeous bar located on the tenth floor of a luxury hotel. The walls are decorated with colorful murals, and the ambiance just screams relaxation. There are also fantastic views of La Sagrada Familia, and a menu curated by Michelin-star chefs. This bar is definitely pricier than your average bar in Barcelona, but there’s a decent selection of items for under 10 euros. For a more low-key experience, head over to La Terraza at Villa Emilia, just around the corner from Plaça Espanya. The views here aren’t as majestic as at the other bars, but the atmosphere is far more intimate, with large plants and trees that create a shaded environment. There are also live music sessions every Thursday and Saturday evening. This rooftop bar, located right across from Plaça Catalunya, is sort of like a mini tropical paradise. Within the terrace, there are lush gardens and flowers that create a captivating oasis. Every Wednesday, Thursday, and Friday evenings, the terrace comes to life with acoustic music. You can relax to the music while nibbling on the kitchen’s famous crunchy chicken. This white-draped terrace with white chairs and tables has a Grecian feel to it. But the design isn’t the only great thing about this place; it also has a top-notch restaurant that serves both Spanish and international cuisines. If you’re a fan of fruity cocktails, you won’t be disappointed by this place. From margaritas to pina coladas, you’ll find some top-notch drinks here. The atmosphere is also fun, with live music and occasional free shots. 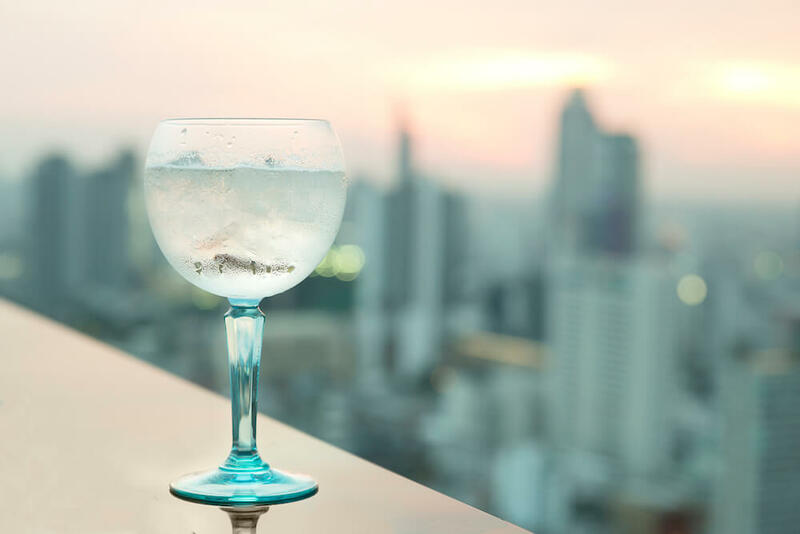 With live shows, great cocktails, and tasty food, no wonder why Gatsby Barcelona is one of the best most popular bars in town. 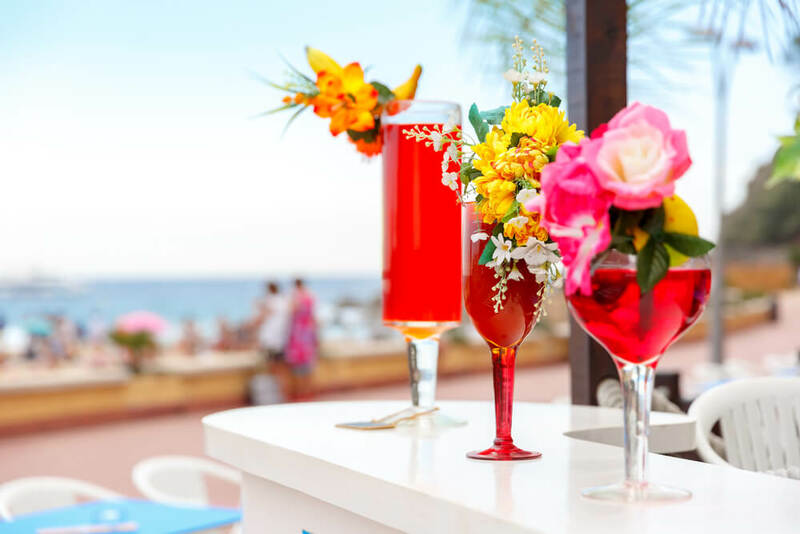 This place is ideal for celebrating birthdays and anniversaries, but you could also go here to, let’s say, celebrate your last night in Barcelona. As the name suggests, this bar is a classic destination for old fashioned cocktails, but you’ll also find new creations. They add different elements like plants, flowers, and chunks of fruit to spice up an otherwise ordinary cocktail. With imaginative drinks, friendly staff, and a cozy atmosphere, you can’t really go wrong with this spot. The luxurious interior is the first thing that stands out about this bar. With red, velvet chairs and a nicely-polished bar, this place immediately greets you with a suave ambiance. Then there are the cocktails – finely crafted, extravagant creations that look too good to drink. Boadas Cocteleria is another must-try for fruity cocktail lovers, From caipirinhas to daiquiris, the menu is brimming with delicious drinks. The atmosphere is more low-key so the venue attracts an older crowd. You won’t find any drunk 20-somethings here, which is a good thing. Once frequented by the likes Ernest Hemingway, Antoni Gaudi, and Salvador Dali, Bar Marsella is one of the most iconic spots for food and drinks in Barcelona. Founded in 1820, it is also the oldest bar in Barcelona. The most famous drink on the menu is absinthe. This bar was also featured in the movie, Vicky Cristina Barcelona. At the bar, you can also order some gourmet tapas. This place gets busy so you may want to make a reservation. There are free concerts at bars across the city. One of the best ones is at Jamboree bar. This bar, located right across from Placa Reial, is a hotspot for jazz, rhythm, and blues. It’s a great place to spend a couple of hours before calling it a day. This over-the-top, quirky park looks like something straight out of a Dr. Seuss book. Along with Casa Batllo, it’s my favorite of Gaudi’s works. This is the type of place to go if you want to feel like a kid again. You’ll find a couple of gingerbread-looking houses and modern designs with pillars. Park Guell is an expansive park that’s free to the public. You only need to pay to see the main area, known as the monumental zone. The best way to experience Park Guell is to do a guided tour. 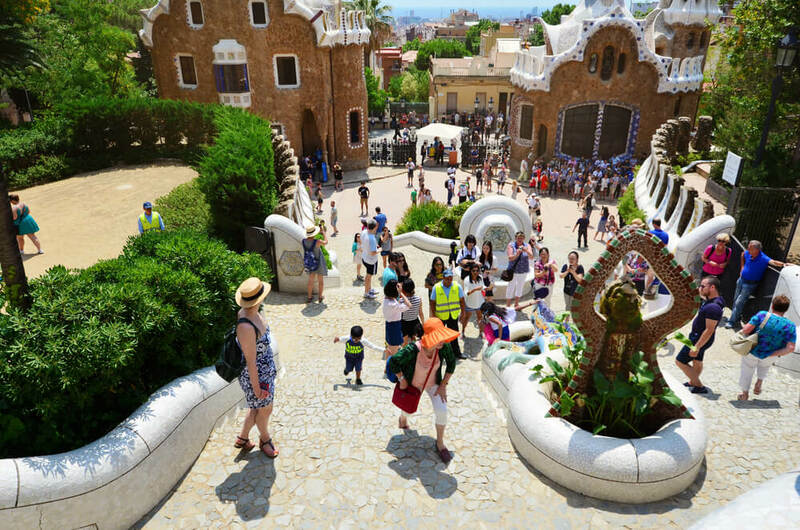 The Get Your Guide Park Guell Tour allows you to skip the line and learn all about the park’s history and significance from a live guide. Money saving tip: you can visit the monumental zone at Park Guell for free every Sunday from 5 pm to 10 pm. Tickets are first-come-first-serve, and there is a cap to the number of visitors. La Sagrada Familia (Church of the Holy Family) is arguably Antoni Gaudi’s most impressive work. 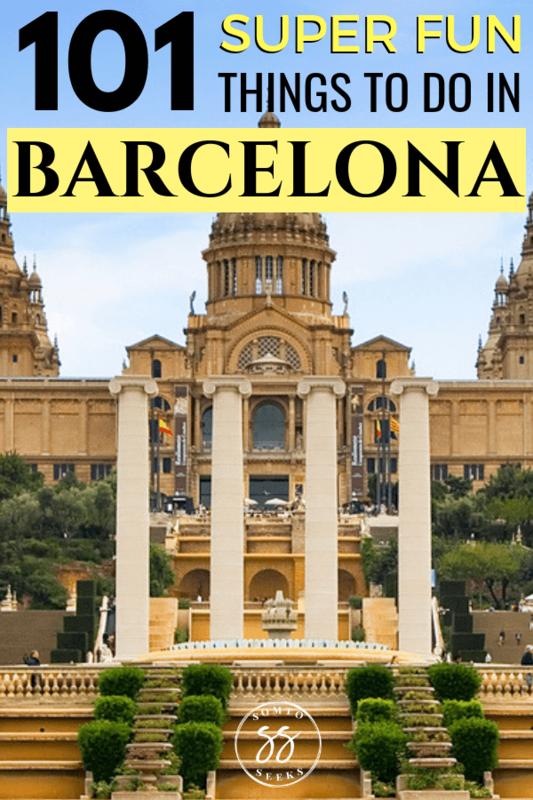 A UNESCO World Heritage Site, it’s the most visited site in Barcelona and the second most visited attraction in Spain (after La Alhambra in Granada.) As you can imagine, this church gets pretty busy. That’s why you should book your ticket online at least a couple of days before you go. The best way to see La Sagrada Familia is through a guided tour that allows you access to to the towers. I highly recommend the Get Your Guide La Sagrada Familia Tour. It lets you skip the ridiculously long lines and tour the church at your own pace with an audio guide. Completed in 1910, Casa Mila was built for a wealthy couple – Pere Mila and his wife Roser Segimon. Funnily enough, Barcelona residents are the time thought the house was hideous. It had an unconventional exterior with contoured waves made out of gray stone. That’s how it got the nickname ‘La Pedrera’ which translates to ‘the Quarry House.’ The best way to experience Casa Mila is to do a tour with an audio guide. With this tour, you get to skip the line and also view the house from the rooftop. The vantage point from the rooftop is really amazing! 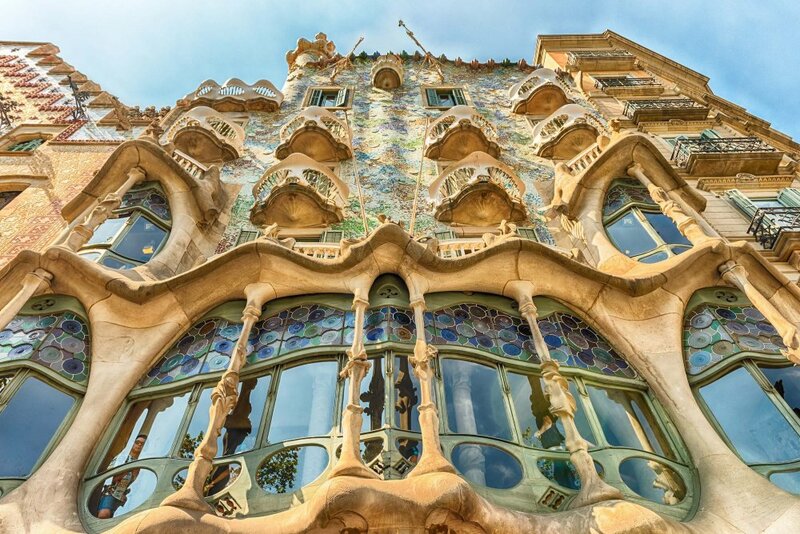 Just down the street from Casa Mila, you’ll find another one of Gaudi’s famous houses, Casa Batllo. The shape is similar to that of Casa Mila, but the exterior is much more colorful. This is by far my favorite of all the houses that Gaudi built in Barcelona. Unlike Casa Mila, the building was actually not built from scratch. The wealthy Batllo family were the owners of the home. They commissioned Gaudi to demolish their existing home and build a new one. Instead, Gaudi simply refurbished it and added his signature waves on the exterior. The best way to see Casa Batllo is to do a guided tour with an interactive video guide. You can skip the lines and explore all of the building at your own pace. Gaudi’s buildings are known for their eclectic design, but Casa Calvet is an exception. It actually just looks like a normal building with heavy Baroque influence. Casa Calvet is located in the Eixample district, where you’ll also find La Sagrada Familia. Gaudi built it for a textile manufacturer known as Pere Martir Calvet to use as both his factory and residence. The Güell Pavilions were a complex of buildings owned by the wealthy Eusebi Güell and his family in the neighbourhood of Pedralbes on the outskirts of Barcelona. Güell later commissioned Gaudí to renovate the design of the main building. The details on the building’s design contain references to Greek mythology. Palau Güell is a townhouse in the El Raval neighborhood that also belonged to the Güell family. Eusebi Güell again commissioned Gaudí to design a modern townhouse destined to entertain members of high-society. The building includes features such as hidden windows to enable hosts to see their guests upon arrival to ensure they were appropriately dressed for the occasion. Bellesguard is a 15th-century historic monument on the site of the castle of King Aragon. The Figueres family bought it in 1900 when it was falling apart and commissioned Gaudí to rebuild it. Naturally, Gaudi added his signature neo-Gothic style while also maintaining the Medieval elements of the original structure. The Picasso Museum is dedicated to the life and works of Pablo Picasso, considered the father of contemporary Spanish art. This museum houses a whopping 4,000 of Picasso’s works. It’s free on Sundays from 3 pm to 8 pm. Otherwise, you can buy a ticket for 11 euros. 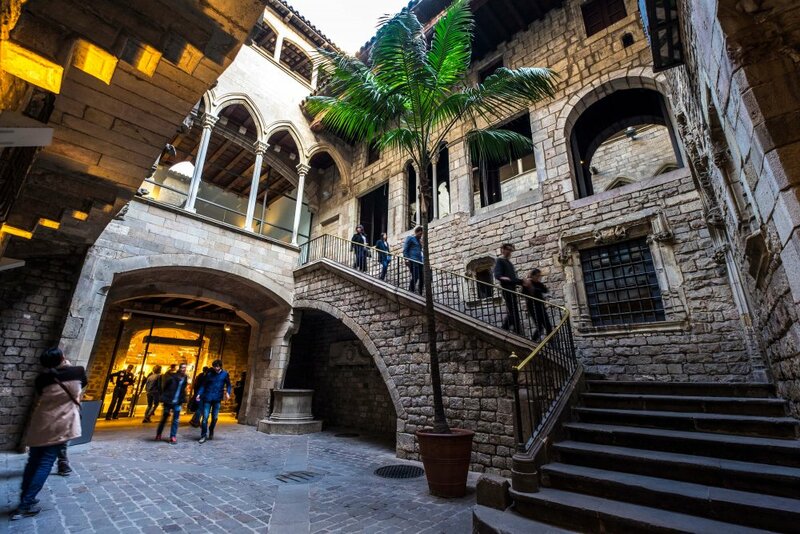 The Barcelona City History Museum showcases artifacts dating back 2,000 years to the Roman occupation. It houses one of the largest collections of historical artifacts in Catalunya. Entrance is free is free on Sundays from 3 pm to 8 pm. Spain was a force on the high seas during the days of exploration. Nowadays, the Maritime Museum houses an extensive collection of ships from Medieval Spain on display, along with interactive videos and audio. You can learn all about Spanish ship making from the archives. The Centre de Cultura Contemporània de Barcelona (CCCB), located in the heart of El Raval, makes often obtuse contemporary art actually relatable. It’s not as popular as the Museu d’Art Contemporani de Barcelona (MACBA), which actually isn’t that great, to be quite honest. But CCCB is arguably better. It offers eye-opening exhibitions that will make you rethink the meaning of not only contemporary art but art in general. The Design Museum of Barcelona, also known as Museu del Disseny de Barcelona, is the perfect spot for fashion, architecture, and graphic design lovers. It is a futuristic building that houses various collections of art and design from around Catalunya and Spain. Science nerds will love this museum with permanent exhibits ranging in subject from constellations to rock formations and everything in between. 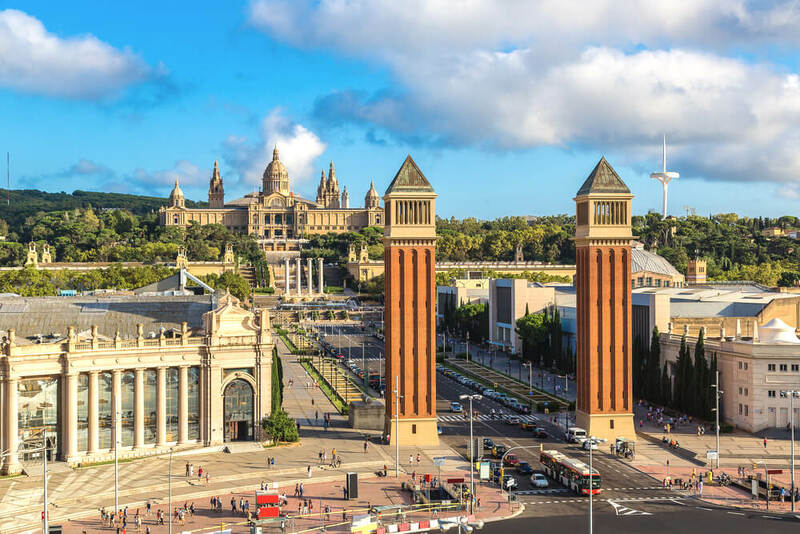 CosmoCaixa may be off the beaten path for the average tourist, but it is beloved by locals and more adventurous tourists alike. Joan Miro was Picasso’s protege who became a well-known painter and sculptor. Fundacio Joan Miro is a museum dedicated to his work in Barcelona, the place of his birth. This museum is located right up Montjuïc hill so getting there requires a bit of a hike. On the outside, you’ll find sculptures while on the inside, there are mainly paintings and drawings by Miró. This museum also hosts temporary exhibits of other works by Spanish artists. Located next to the Museu Picasso, The Museu Europea d’Art Modern, or MEAM is a well-curated exhibition of Spanish artists who are still living and working today. MEAM has a simple purpose: to establish a dialogue and find meaning in modern art rather than making metaphorical or literal noise in the art community. As someone who despises pretentious art, I’m all for that. The museum of Catalan history, next to the port in Barceloneta, tells the story of Catalunya’s storied past. It’s a great attraction for those who want to learn more about the heritage and culture of the region. Through both temporary and permanent exhibits, this museum shines a light on everything from the Visigoth and Roman eras to contemporary Catalunya. The Museu Nacional d’Art de Catalunya, or MNAC, is possibly the largest collection of Catalan art in the world, with works ranging from Romanesque murals and religious paintings, to examples of Catalan Modernism and photography. This museum’s front stops are also really iconic – you’ve probably seen them in postcards before. Not a bad place to take a photo. The Day of the Three Kings is the biggest event during the Christmas season in Spain. It’s even bigger than Christmas day! The annual parade is held in early January. What’s the celebration? 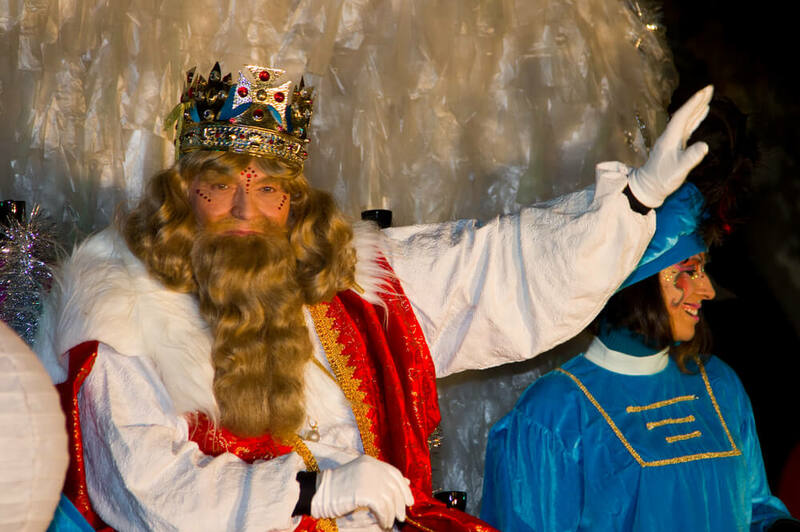 The festival officially welcomes the arrival of the three kings – Balthazar of Arabia, Melchior of Persia, and Gaspar of India. These three went to Bethlehem with gifts for baby Jesus so the Day of the Three Kings is when people exchange Christmas gifts in Spain. There’s a grand reception when the three kings arrive at the Port of Barcelona aboard their ship, the Santa Eulàlia. Barcelona’s mayor gives the Kings keys to the city so that they can go around and give gifts to children. Then there is an explosion of fireworks and canons. Lasting one week, Barcelona Carnival takes place on the streets of the city and has done so since the 1500s! There are over 30 parades around the city, with people wearing elaborate costumes and dancing. You can also expect giant floats, orange balloons, and fireworks to celebrate the ‘Arrival of the King.’ This is when the ‘King of Carnival’ makes his triumphant entrance into Barcelona to commemorate the festival. Held in the Gracia district, this epic candy festival is a must for anyone with a sweet tooth. During the boisterous procession, organizers throw an insane amount of sweets into the crowds. It’s more fondly known as La festa més dolça (the Sweetest Festival) and I’m sure you can see why. La Feria de Abril (the Festival of April) is best known in an extravagant annual celebration in Sevilla, but Barcelona has its own version. It’s a weeklong flamenco festival that follows in the aftermath of the city’s mega Easter celebrations. At this top event in April, you lucky things can expect a showcase of all things Spanish with horse riders, fun fairs and good times galore! You’ll find this in the Parc del Forum in the Diagonal Mar area of Barcelona. Other highlights include paella dishes that are the size of a small car and a Ferris wheel, offering some of the best views over the city. Every August, the Gracia neighborhood hosts its annual Festa de Gracia. During this festival, there’s a competition to see can create the most elaborate decorations. That’s why all the streets go all out to outdo each other with colorful designs and artistry. You’ll also find many free concerts and outdoor events for both kids and adults. You can plan your trip for late September in order to experience the five-day Festes de la Mercè. During the festival, the whole city lights up with fireworks, dancing, free concerts, and the famous correfoc, a procession of men people blasting fireworks into the air. 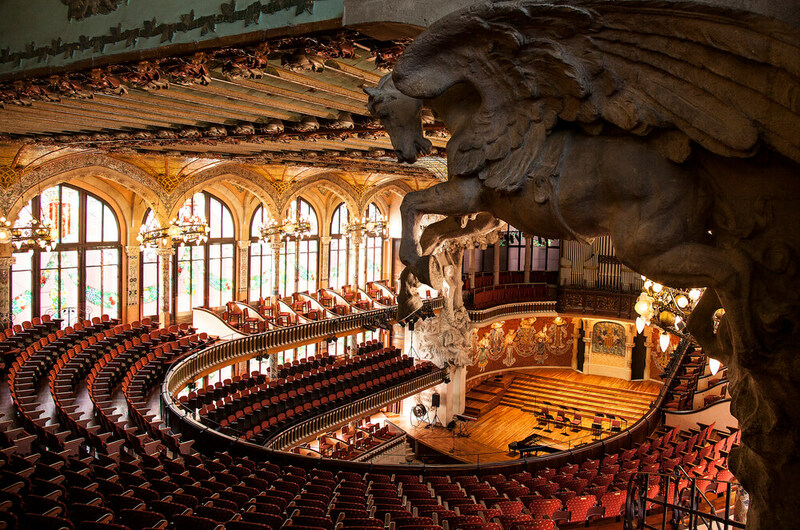 This concert hall, a UNESCO World Heritage Site, has the most exquisite design and decor! The venue hosts performers from all around Spain – mainly musicians and dancers. Check out their website for upcoming shows. *Before I talk about the next two venues, I’d like to say that I don’t recommend you see a first Flamenco show in Barcelona. At least not your very first show. To start off, Flamenco shows are more expensive here. Also, the people of Catalunya have their own traditional dances that you can see, like the Sardana. For Flamenco, I would head south to an Andalucian city like Granada, where people live and breathe Flamenco. The dance was created by the gypsies in Andalucia. Named after the famous Flamenco dancer, Carmen Amaya, this popular venue regularly hosts top Flamenco dancers and performers in Spain. It is located in the heart of the Poble Espanyol – a large-scale model village that also hosts a famous Christmas market. Okay, The Tablao de Carmen is meant to simulate a small village atmosphere, with guests sharing tapas and drinks while watching the Flamenco performances. Located close to La Sagrada Familia, the Palacio del Flamenco is the largest flamenco venue in Barcelona. It’s a very big place – with a capacity of almost 400 people. If you’re looking for the type of intimate Flamenco experience, then Tablao del Carmen is a better option. But if you just want to watch a lively performance and have a good time, be my guest. There is a gorgeous escape in the Montjuïc area known as the Laribal Gardens. Highlights include the ‘Escaleras del Generalife‘, a staircase bordered by trickling waterfalls inspired by the Generalife Gardens at La Alhambra in Granada. Just stunning! I wouldn’t count Barcelona’s beaches among the best beaches in Spain. That said, some are definitely better than others. Nova Icária, just a 25-minute tram ride from the city center is relatively clean, relaxing, and not-so-crowded. Nova Icaria beach is widely considered the most peaceful in Barcelona. This beach is also close to access to great restaurants and bars, making it popular among foodies. Nova Icaria boasts a game area with ping-pong tables and volleyball courts. Just a 30-minute train ride north of the city center, Ocata beach is pristine, flat, and tranquil, complete with beautiful golden white sand. Much less busy than the other beaches, this is more of a peaceful getaway and less of an entertainment area. Long, and wide, this beach is spacious and attracts fewer tourists than the beaches next to the city center. That makes it the ideal choice if you’re looking for more privacy – a luxury in the summertime when visitors have to compete for space at the popular beaches. Ocata Beach also has a few chiringuitos, small beach restaurants, that serve drinks, tapas, and hot food. Bogatell beach is one of the safest beaches in Barcelona and, therefore, attracts an older crowd. It is much smaller than La Barceloneta and the other more touristy beaches but also cleaner. Overall, it’s a great place to spend a few hours on a sunny day. Praised for its peacefulness, Mar Bella is another of the beaches created during the restoration of the seafront as part of the urban development for the Olympic games. Much more tranquil than La Barceloneta and Sant Sebastia, and lacking slightly in bars and restaurants, Mar Bella is still bursting with opportunities for water sports, offering the chance to windsurf, kayak and even try out some new sports. Twice the size of Nova Icaria, there’s plenty of space to sunbathe, do sports, or even rollerblade on the beautiful promenade. At Mar Bella, you can rent a sunbed and relax by the ocean. Sant Sebastia is one of the longest beaches in Barcelona. Thus it attracts tourists and locals alike. This beach can get very crowded, especially during the peak summer season. Still, it’s a good choice as there’s a lot to do within and around the beach. You can play volleyball and ping pong on the beach due to its sporting facilities. In the immediate area, there are a host of restaurants and bars where you can pop in for a drink or a meal. 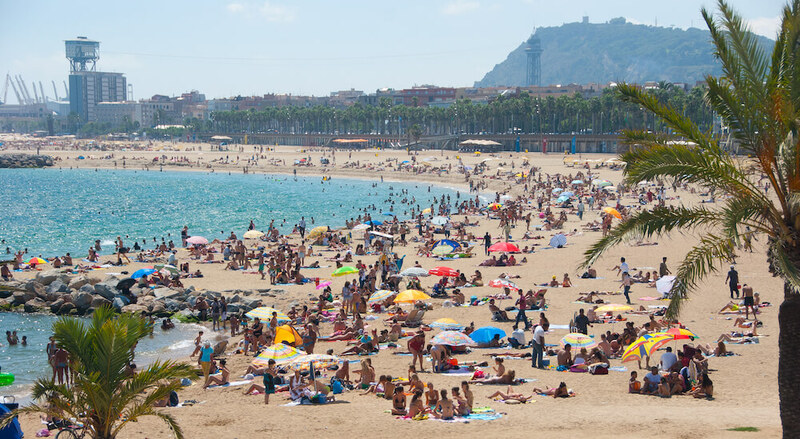 La Barceloneta is hands down the most popular beach in Barcelona. It’s also the closest to the city center and is located on the coast of the popular neighborhood which shares its name. This beach is not quite a relaxing destination given the abundance of visitors, vendors, and even trash. But if you don’t mind crowds and noise, you can have a good time here. On the plus side, there are a ton of entertainment and food options both at the beach and in the surrounding area. If you’re into extreme water sports like windsurfing and kite-surfing, you can do those here. Located right next to the Design Museum, this flea market has two floors full of vintage clothes, paintings, jewelry, pots, silverware, and everything in between. You’ll find some random, outdated junk in the mix, but there are also some rare gems. You just have to look around for a bit. When you’re done shopping, you can get some food at the restaurants on the second floor. Espadrilles – or espardenyes as they are called in Catalan – are a traditional shoe in Catalunya that you may want to take home as a souvenir. They’re normally worn for special occasions like festivals and dances, but many people also wear them as regular shoes. Made with cloth and a natural fiber sole, these shoes are lightweight and comfortable. Toni Pons is a Catalan shoe brand that offers these shoes in many colors and designs, including high heels. It’s a chain so you’ll find different locations across the city. You’ll find three different locations on the map. This arts and crafts shop in the gothic quarter carries some fine ceramics and pottery you can take home to your loved ones. You can find everything from bowls to pitchers to pots. Another great thing about this place is that the pottery comes from every region of Spain so you can buy a diverse set of items as a keepsake. If you’re looking for handmade leather goods, Cuirum is the place to go. It’s a family-owned business that has been passed down for several generations. The owner learned the business from his father and makes all of the goods. He will make you a custom bracelet or belt on the spot while you are there. Here, you can buy high-quality belts, wallets, purses made with the finest leather. El Rastro de la Virgen is a monthly flea market organized by the members of the now defunct La Virgen Cultural Center. This venue was inexplicably shut down by the local council after serving up amazing live music for years. The spirit of La Virgen lives on in this friendly, community-spirited market which takes place every first Saturday of the month in El Raval. Lost & Found is a new thrift shop in Barcelona specializing in vintage fashion and accessories. You can also find home decor, books, and crafts here. The location of this market varies depending on the time of year. Lost & Found is either organized outside by the Moll de la Fusta near La Barceloneta Beach, or inside the Estación de Françia. 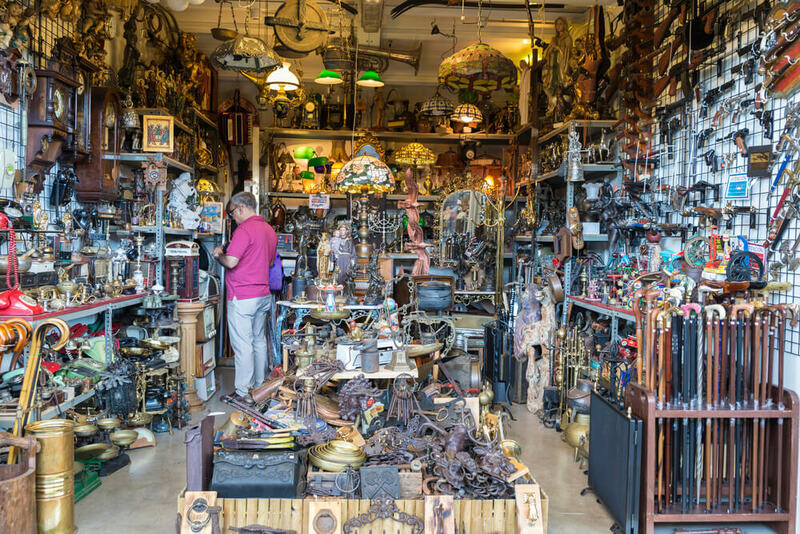 Located in the nearby town of Sant Cugat, Mercantic is a giant market for antiques, vintage fashion, furniture, and more. You can get here in just 15 minutes by train. The market covers some 160,000 square feet inside a warehouse. Within it, there’s a bar, bookshop, and live music venue. La Maquinista is the only open-air mall in Barcelona. Although it’s not as central as other shopping malls, it’s also one of the biggest in Catalunya. There are a lot of popular shops like Zara and Mango but no luxury stores. On a sunny day, this is also a fun place to grab lunch and hang out. Montserrat, a mountains town about 22 miles away, is one of the best day trips from Barcelona. It’s home to a couple of famous tourist attractions that you can see all in one day. First up, you have the Santa Maria de Montserrat, a monastery and pilgrimage site for Catholics. Visitors from all over the world come here to see the legendary Black Madonna or La Moreneta. Then there’s the Stairway to Heaven. 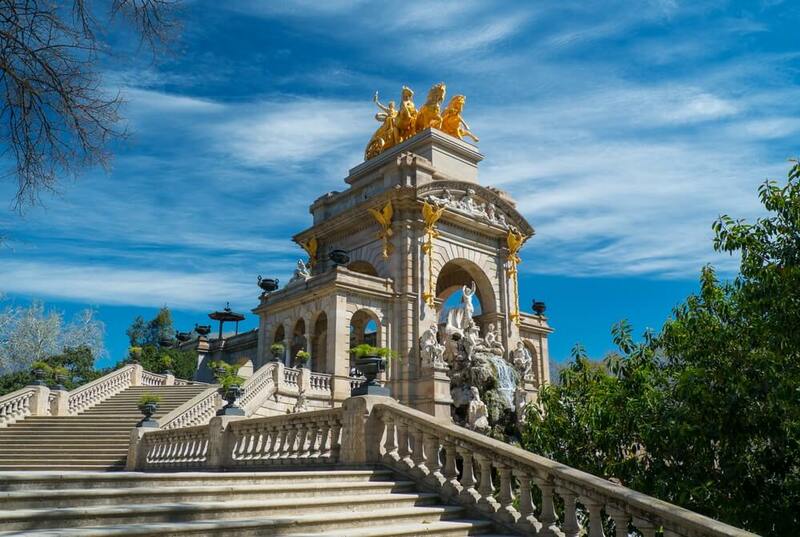 This iconic structure, which has 8 stairs, is a monument devoted to the Catalan philosopher, Roman Llull. The 8 stairs represent Llull’s 8 stages of awareness: stone, flame, plant, animal, man, heaven, angel, and God. Lastly, there’s Sant Jeroni, the highest peak at Montserrat. From here, you can also get a bird’s eye view of Catalunya for miles. Zaragoza is one of the most underrated cities in Spain. While virtually unheard of among tourists, the city is famous for the Fiesta del Pilar, which takes place every October. For a week, there are nonstop fireworks, parades, concerts, and performances to pay tribute to the Virgin of Pilar, the patron saint of the city. 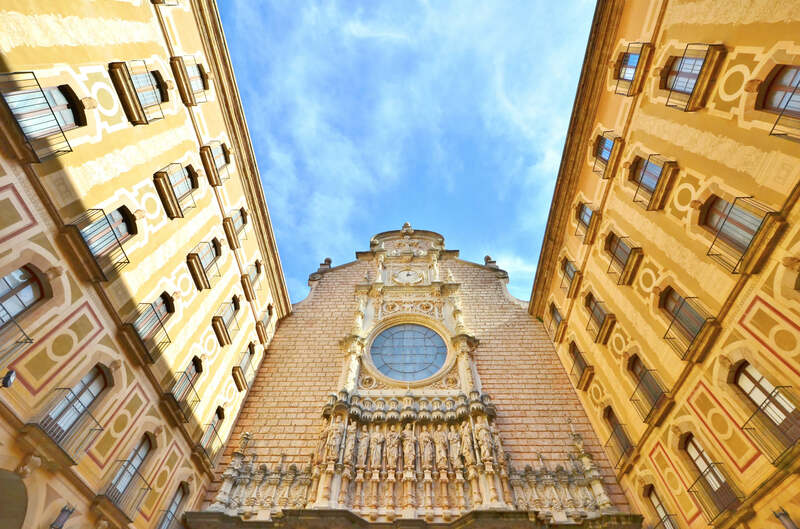 Zaragoza is located in the community of Aragon, just a 1.5-hour train ride from Barcelona. Must-see sites include the Basilica del Pilar, the Aljaferia, and the Goya Museum. If you’re looking for relaxing, white sand beaches then Sitges is the place to go. This resort town is about 20 miles south of Barcelona on Costa Brava. It’s home to almost 20 white sand beaches. That said, Sitges is a major tourist resort so it may not the place to go if you’re looking to escape the crowds in Barcelona. You’ll find some secluded beaches, but those will require more travel time. Besides beaches, Sitges is famous for its local sweet wine, known as Malvasia. Girona is a colorful, historical city located about 60 miles north of Barcelona. This city looks a bit like the area in Florence surrounding the Ponte Vecchio Bridge. It’s one of the most popular day trips from Barcelona and is only a 45 minute-1 hour train ride away. 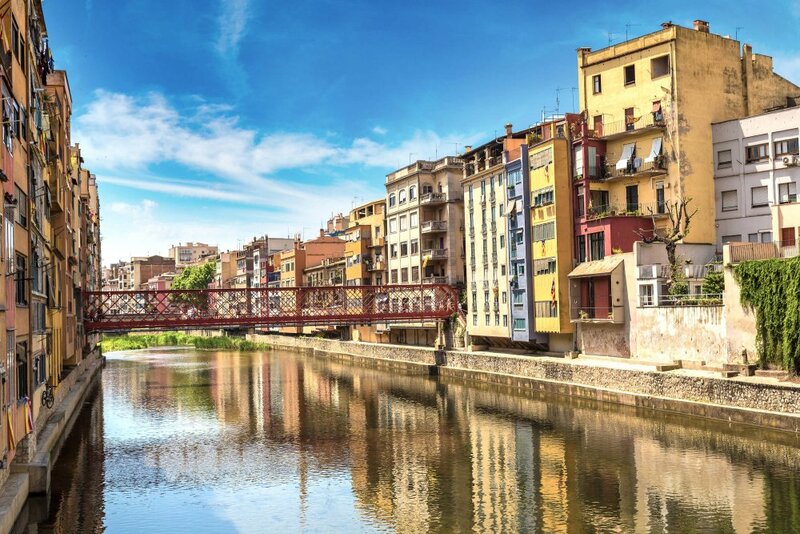 Girona is known for its rivers, bridges, perfectly-preserved Roman walls, and brightly-colored houses. While in Girona, be sure to check out the Arabic Baths and the Girona Cathedral. Figueres was the hometown of the famous painter Salvador Dali. There, you’ll find Teatre-Museu Gala Salvador Dalí (Dali Theatre and Museum), a museum dedicated to the painter. It was built on the same spot as a government building that was destroyed during the Spanish Civil War. The museum is also Dali’s place of burial; his tomb is in the basement. Within the museum, you’ll find Dali’s famous paintings as well as never-before-seen personal items. Andorra is a tiny country sandwiched between France and Spain. Mainly known for its ski resorts, this country makes for a great escape during the winter. The capital, Andorra La Vella, is home to many attractions that you can see in a day or less. Tarragona is a coastal city about 50 miles south of Barcelona. There are basically two words that describe this city – Roman ruins. Visiting Tarragona is like going back to Roman times; the entire city is like a museum. Points of interest include the Tarragona Amphitheatre, the Tarragona Cathedral, and the Roman City Walls. 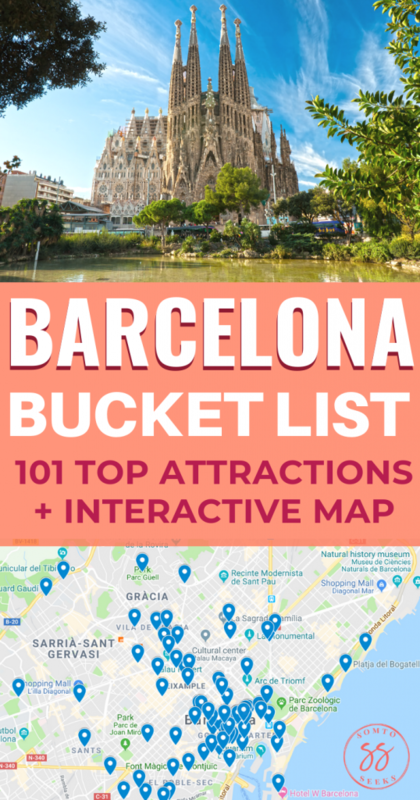 There you have it – 101 of the best things to do in Barcelona. Which of these attractions are you going to add to your itinerary? One more thing – if you liked this post, please share! Thanks for the positive feedback! I’m glad you found the list and the map helpful! Hope you enjoy Barcelona.